Anesco's 3.75MW battery, alongside a 235kWp Tesla system, has joined ~330kWp of solar and 1MW of wind generation at the Philip Dennis Foodservice site. Image: Anesco. Food wholesaler Philip Dennis Foodservice has installed energy storage units totalling over 4MW at its Barnstaple offices in an effort to generate revenue from grid services, rather than making savings from behind-the-meter activity. The £2.2 million investment has seen three one-hour duration units from Anesco totalling 3.75MW which were energised at the end of May and connected directly to the electricity grid. At the same time, a 256kw/512kWh Tesla battery was also installed which will deliver firm frequency response (FFR) until April 2020. The company is working with Limejump to aggregate its capacity to deliver further services, with around £750,000 in revenue expected over the next 20 months. The units will also be used to meet Capacity Market contacts won earlier this year. According to Peter Dennis, director at Philip Dennis Foodservice, the Tesla battery had been intended as a proof of concept but was “linked” with the capacity of the Anesco units to ensure that the T-1 contract for delivery at the start of October could be met. "Quite quickly the two projects became linked and so to pull out of one would have meant a loss of all our sunken costs, which were probably around £100,000,” he said. The batteries will be monitored by Anesco’s operations and maintenance service, to ensure they continue to operate at their optimum efficiency. 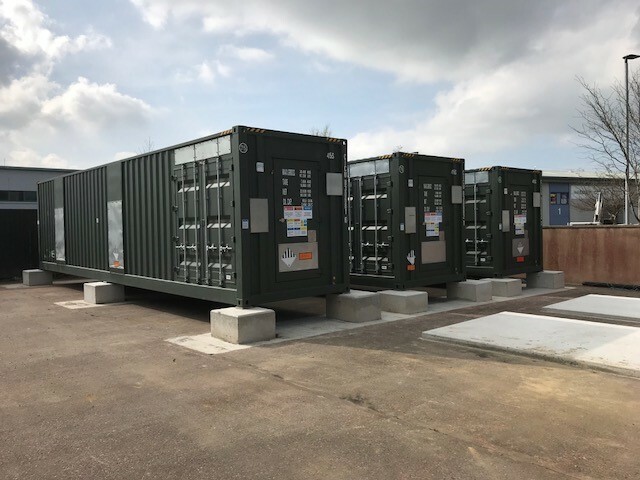 The installation of battery storage at the site is the latest in a series of investments made by Philip Dennis Foodservice in low carbon technologies, having installed two solar arrays at the Barnstaple site. The Tesla battery has been installed near to a 235kWp system, while a 97.5 kWp is helping to power the company’s butchery department. It also boasts two 500kW wind turbines, which in Dennis’ words makes the site “quite unique” in having wind, solar, demand and now battery storage. “Improving our carbon footprint through investment in renewable technologies is really important to us. It is a key USP and differentiates us from others in the market. We were quick to recognise the opportunity that solar and battery storage presents and are already achieving good returns,” he said. With 1.5MW of grid capacity still unused on the site, Philip Dennis Foodservice is now considering more solar and is early talks with flow battery suppliers for future installations. While not currently used for behind the meter activity such as Triad and distribution network charge avoidance, the company hopes to adopt these use cases in the future. Anesco meanwhile is on track to more than quadruple its operational battery storage portfolio by 2020, as its order book swells to 380MW.